It was disgusting: a pale, spindly creature, awkward looking and with wriggling, probing extremities. Patchy, fluffy hair clung to its cheeks, and it looked uncomfortable in its own skin, its arms hanging clumsily by its side as its tired eyes darted around nervously. Its name was Scott Ryder. Mass Effect is back, and this time you’re the alien. Before the Reaper invasion of the original trilogy, a private organisation creates the Andromeda Initiative to fund a 600-year interstellar journey across dark space and to our neighbouring galaxy, Andromeda. Various races from the Milky Way join the Initiative, volunteering to be put in cryo sleep aboard an Ark (a hulking, spacefaring city) in a bid to find new homes. Golden worlds, these paradises are called. Spied by using technology from the sentient AI race known as the Geth, the Initiative know that a handful of planets in the distant Heleus Cluster could support life. For those volunteering, it’s the promise of a fresh start, the chance to be a pioneer in a world where everything has been discovered. Just as when, in Earth’s own history, European immigrants were lured to America on the basis that the streets were paved with gold (only to find out the streets weren’t even paved, and that they’d be the ones doing the paving), the members of the Initiative soon find these worlds aren’t as golden as they were lead to believe. Ark colonisation efforts are headed up by a Pathfinder – an exceptional person from each race who’s qualified to seek out new worlds and make them more viable for sustained life. The human Ark’s Pathfinder is your dad, Alec Ryder: an ex N7 operative and all-round cool dude who has trouble saying “I love you” to his kids. Things don’t go as planned, thanks to a shooty first contact with a mysterious race of carapace-clad aliens called the Kett. Spoilers happen, and you end up being gifted a magic space hand from your super dad (each Pathfinder is melded with an AI for heightened, well, everything), before being named Pathfinder yourself. You can play as Scott or Sarah Ryder, both of whom have their own backstories and personality quirks. More than ever, you feel like you’re playing as a character, rather than as yourself. You can choose the tone of response – emotional, angry, flippant, or analytical – but the end result is broadly the same. 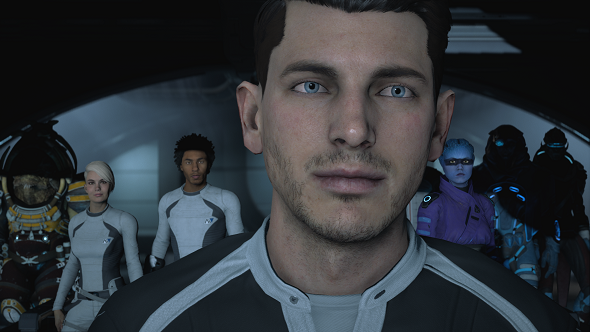 You won’t be getting horribly scarred cheeks like Commander Shepard for being too much of a dickhead here, as Andromeda leaves behind the binary morality system of the original trilogy for something more natural. Rather than feeling like you’re doing a ‘blue’ or ‘red’ playthrough, here you feel like you’re reacting to each situation based on the information available. It’s a better system, as it actually makes you think about your choices more. It’s just a shame that there aren’t a few more big forks in the road, as Andromeda is light on big decisions. It also feels like the consequences of the decisions you make won’t be clear until the next game, which hasn’t even been announced yet. That’s not to say the story is bad. There’s plenty of intrigue, particularly with your father’s ties to the Milky Way and the advanced AI he brought to Andromeda, and the characters are mostly interesting to talk to – particularly Drack, your grizzled krogan companion who’s basically Breaking Bad’s Mike if he were a turtle alien with a fondness for headbutts. Conversely, Liam Costa, your human buddy, is basically Andromeda’s Kaidan Alenko – a man with as much personality as a Rich Tea biscuit dunked in tepid piss. There’s also the odd line of dialogue that will make you want to die, but it does its job as a piece of cheesy space opera. Andromeda’s main story issue is player expectation, however. This is an entirely new galaxy, so you might go into it anticipating a wide variety of new, strange alien races to become acquainted with. Even life on Earth has evolved in bizarre ways – you only have to look at the horrors that lurk in our ocean’s abyss to see what biological variety even one planet can support. Despite this, Andromeda houses just two sentient species – the angara and the kett – and both of them are humanoid. The Milky Way in the original trilogy gave us the Hanar – levitating, monotone jellyfish – but there’s no such imagination here. The story also has an over-reliance on the ‘ancient power’ trope, with your colonisation efforts anchored to ancient alien technology left behind by an enigmatic race dubbed the Remnants. 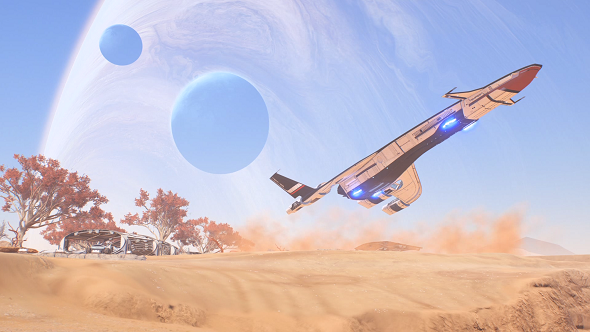 Once you get past the fact that you won’t be trying to shag conscious clouds of gas – or whatever other bangable oddities your mind had conjured up – and instead begin enjoying Andromeda for what it is, though, you’ll have a great time. How it actually feels to play is a massive step up for the series. Whether tearing across a planet in the Nomad – Andromeda’s speedy, hill-climbing, rocket-boosting, jet-jumping land vehicle – or zipping between cover points on foot, it’s a big leap forward – quite literally, because jetpack. There are loads of little improvements to combat, from little things like having the ability to blind-fire, or being able to switch shoulders, to big changes such as contextual, non-sticky cover. 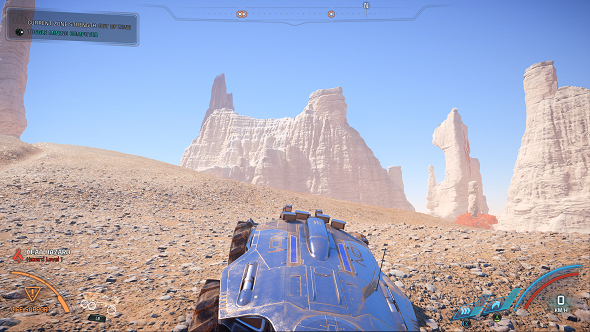 In practise, this means you can pull up to an enemy base in the Nomad, hop out, and press up against it as cover. Cover being non-sticky also encourages more movement around the battlefield, as do certain enemy types who close in for a devastating melee hit. Grenades also get you moving. Luckily, you’re equipped with a rocket pack – or biotic levitation if you go Adept – so you can boost into the air or perform quick dashes, either away from trouble or towards an enemy where you can get personal with Krogan hammers, omni blades, Asari swords, and other close-quarter murder tools. Though enemies lack the feedback of Mass Effect 2’s destructible robotic drones, the combat feels the best it ever has. It’s frenetic, fun, and, crucially, it remains as such through the 50-odd hour adventure. Some streamlining of systems doesn’t work as well, however, such as the fact you can only equip three combat powers at a time. In symbiosis with SAM, your AI helper, you can switch combat profiles on the fly – opting for Soldier when you want to lay down fire, or going Adept when you want to do biotic damage, for example. The thing is, the three power restriction discourages experimentation, so you’ll likely max out three powers and pump the remaining points into passive skills. It’s a shame that there’s all this flexibility being teased, but then one design decision undermines it. You will feel the loss of the power wheel from the original trilogy. Likewise, you can only tell your two party members where to go or who to attack. You can’t tell them to deploy their powers, so you have to react to what they’re doing if you want to combo powers with theirs, and you have to hope they do the same when you send some kett squaddie skyward with a biotic pull. Still, the core combat feels right, despite these grievances. Curling a biotic push around a piece of cover, sending an enemy flying from a cliff, never gets old. 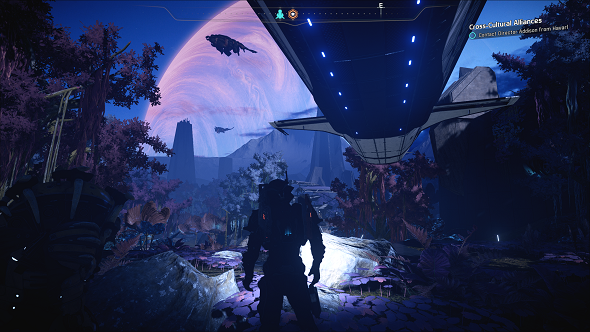 Another thing Andromeda nails is the feeling of being an explorer. Whether you’re trekking through a deadly jungle by twilight, sticking to the shade on a barren desert planet, or huddling by heat lamps on an icy tundra, you’ll feel in awe. It does spectacle better than most. It’s even in the small details, like how you can park your speedy spaceship, the Tempest, by a planet and disengage from the galaxy map – there, in the ship’s canopy, you can see the world you’re about to explore fully rendered in front of you. The game’s environments are breathtakingly gorgeous. Zipping around these locations in the Nomad also feels fantastic. It’ll angrily screech up almost any surface with enough boost and with six-wheel drive engaged. When you want to go fast, disengage the off-road mode and you’ll tear across the flats. You can throw it from a mountain peak and the suspension will take it in its stride. It’s a game about exploration, so it’s crucial that simply navigating its worlds a joy. Much of what you do on these worlds is similar, however, with only environmental hazards and narrative context changing it. You’ll delve into Remnant vaults, you’ll scan things, you’ll clear out Kett bases, you’ll collect stuff, and you’ll battle massive Remnant guardians buried in the earth. The core gameplay carries it, but you do sometimes find yourself wishing it was a bit more imaginative. Those Remnant vaults also have to be accessed by scanning glyphs and solving a puzzle that can only be described as space sudoku. An item exists to let you skip these, but I never found a single one of them during my entire playthrough. Space sudoku should have been ejected out of the airlock. It should have been ejected with Liam. Mass Effect: Andromeda is a game you enjoy more when you begin to accept that us humans are the strangest thing in it. Have you ever really considered what we look like? We’re bloody weird. I mean, look at your feet, they’re disgusting. 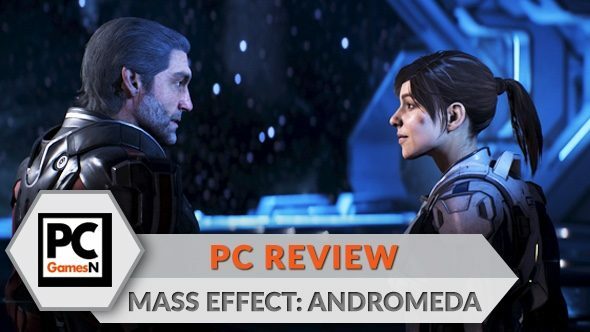 Andromeda’s emotionless, marionette-style faces don’t help make us look any less bizarre, either. The Angara and Kett must be terrified of us. I don’t envy BioWare, because Andromeda is a huge undertaking. Not only does the game have to exist on its own merits, but it also has to stay open for a possible sequel. For that reason, it ends up feeling a little like an origin story. Even after the credits roll, there are hints at what’s in the series’ future. Still, if you look at it as a reboot, a starting point for the series, there’s lots of promise in that future. The first Mass Effect had countless problems, far more than here, but that will always be remembered as a classic, despite leaving similar threads hanging. Ultimately, this is a story about laying the foundations of a civilization, and it feels like BioWare were doing the same for the future of the franchise. In that way, these RPG developers have become Pathfinders themselves.